Multibarred angelfish larvae (Paracentropyge multifasciata) were raised from captive-spawned eggs at 77-79F on wild copepods and artemia. The Multibarred angelfish is widespread in the western Pacific, north to the Ryukus, Japan, east to the Society Islands to south the Great Barrier Reef. It also occurs at Cocos-Keeling Island in the Indian Ocean. This species can be found at depths from 40 to 230 feet where it inhabits caves and reef crevices. It can often be found swimming upside down under large overhangs colonized by sponges at outer reefs. In the aquarium this species has a reputation for being timid and difficult to acclimate. In fact, my broodstock animals could not be coaxed to properly accept aquarium foods for six weeks. Sadly, most collected multibarred angels survive only a few weeks in captivity. 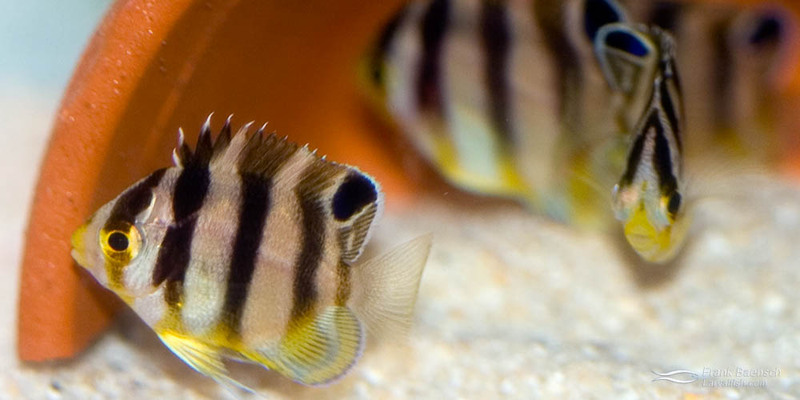 I was excited to find that my captive-bred multibarred juveniles eagerly accepted aquarium foods and that the shy behavior often found in collected adults was absent. Juvenile Multibarred angelfish can be distinguished from a adults by a reflective blue eyespot, edged with white anteriorly, at the back of the dorsal fin.